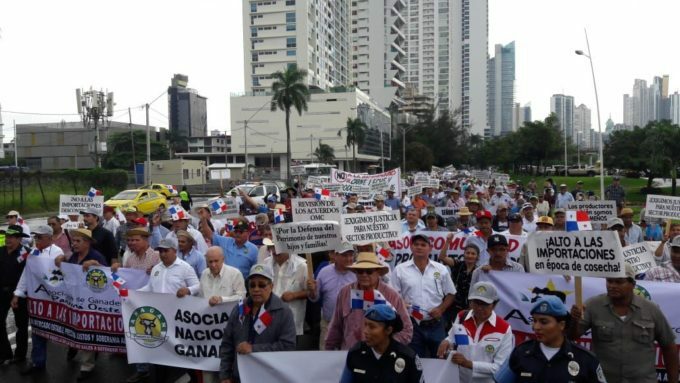 Panama’s Chamber of Commerce, Industries and Agriculture (Cciap) has condemned the State abandonment of the agricultural sector which has led to the current stream of street protests and constant complaints from producers, and calls for measures to prevent the imminent exacerbation of the problems. "The situation lies in the lack of State policies that, by not knowing the strategic importance of agriculture in the life of the country, they left it unprotected, without a guiding compass and at the mercy of cyclical subsidies that eventually fostered the desertion of the field and the migration of youth to urban centers … "this has led us in a few years to e the disappearance of a great number of products that previously arrived fresh at the tables of our homes. " The Chamber argues that "the special characteristics of our economy impose the need to harmonize the relationship between the different productive sectors, in this case, the agricultural and the importer, so that, instead of collision they converge in finding the solutions for the problems of universal interest ". The farmworkers have gone so far as to throw away their products or march with horses and cows to the Presidency to raise awareness of the authorities because they feel overwhelmed by imports. The Cciap stressed that "it is completely inappropriate to authorize the importation of items coinciding with their harvest cycles in the country ". There is "the imperative need to create a single National Food Authority of Food to ensure the safety of all foods, wherever they come from, ” said the Chamber's statement. The businessmen also reasoned that the Institute of Agricultural Marketing (IMA) "must resume the spirit for which it was created, the role of direct imports of agricultural products. and the definition of market prices, because it represents unfair competition for domestic producers." This institute must, above all, market Panamanian agricultural the production so that it can face the "challenges posed by trade agreements and the opening of international markets. The Chamber also underlined the inefficiency of subsidies as an effective response to structural deficiencies and asks for empowerment in the management of family businesses in the production and marketing of exportable items, as well as financial facilities in appropriate conditions. "These policies must integrate the family environment with the fundamental purpose of Affirming a high sense of permanence, as well as belonging and pride among those who work the land, "to stop the exodus to the cities. In addition, they reject the price control established by the Varela government from 2014 because "it is contributing to killing the sector. It was an emergency measure that they decided to extend, further deteriorating the industry. " The Cciap announced that it will carry out "extensive consultations in Country Agenda 2019-2024, to reflect specific recommendations that stimulate the agricultural sector, where national producers, agribusiness, trade and the State are engaged … and we will seek to provide practical and viable suggestions the report concludes. PANAMA | TOGETHER PANAMA SHOULD LIST DEMANDS Good points, I omitted some points you brought up graciously. Reducing government / public officials with unaccountable spending. General Comptroller is still in the investigation process with N.A. Too many airports may lead to careless national security. Panamanians appear to be slow to do something unless bribed. Transportation improvement are underway albeit, slow. Panama flooding situation need to be drastically improved. Panama may need to depend on subsidies to stay competitive. Panama needs more student mentors but has to fit schedule. Government ethics whistleblowers need to be at the forefront. Business man / Martinelli should not threaten to know witnesses. Business man / should not bribe / increase police raises. National Assembly are generous for votes, want payback. Panama professional groups (Unions, etc.) has little effect on N.A. Panama professional groups (Unions, etc.) has little effect on Panama President Varela on many issues including corruption. Panama Pres. Varela appears to have his own agendas / elite. Panama Credentials Committee must study issues: Panama presidential candidate agendas for nation's future. Panama National Assembly agendas with public funds. Panama new constitution proposal from president Varela. Panama government public officials public funds expenditures. Panama Credentials Committee was under attack with who is to be elected for the Credential Committee regarding parties. Issues was not even raised on many levels. PANAMA | RECOURSE TO SUDDEN FOREIGN INFLUENCE Panama must insulate their nation with Latin skill employment positions. Panama must employ skilled workers from a strong democratic society. Panama must not sign agreements compromising their trade and economy. Panama must not elect or re-elect notorious elites under criminal investigation. Panama must eliminate Martinelli's inner circle from political influence. PANAMA | INTERNATIONAL BALANCE OF POWER SHIFTING United States is in a trade war with China. China wants to build a fourth set of locks with Panama. U.S. / China trade war slows down the fourth canal project. Europe will be buying soy beans and oil from the U.S. United States has already saved $52 billion in trade. United States trade will renegotiate for a fair trade deal with China. United States trade / economy may be in jeopardy with democrats. U.S. democrats want socialism and may derail Trump's policies. Panama may become socialist with influence of U.S. democrats. Panama National Assembly has an iron grip on Panama. Panama National Assembly want total control of Panama funds. Former president Martinelli founded corrupt Cambio Democratico. Panama CD uses public funds to re-elect themselves. Panama French name presidential candidate may influence trade. Panama may suffer sudden extreme trade deficits. China / France may barter share of new Panama canal expansion. Panama farmers may be pushed out of their land. Panama locals will not compete with foreign skill jobs. Panama locals will live in poverty in designated areas. Panama political elites will rule with foreign interests as operatives. United States will lose it sphere of influence and power status. United States may join foreign forces to regain power status. To your reply: Facts indicate a foreign power shift for a small isthmus with Panama internal elite operatives. PANAMA | FAMERS CANNOT COMPETE WITH IMPORT Facts and failures of Panama government: 1.Panama farmers cannot compete with imports. 2. Panama price control / fines do not help the farmers. 3. Panama corn had to be disposed. 4. Panama milk had to be bought back by the government. 5. Panama agricultural policies and regulation is out of control, faces disaster. 6. Panama plan for new fourth set of locks would push out the farmers / future. 7. Panama plan for new fourth set of locks would essentially require a new lake. 8. Panama prison are substandard for human conditions. 9. Panama corrupt elites investigated, provided access to election campaigns. 10. Panama N.A. published as a rotten organ, re-elects Yanibel Abrego president. 11. Panama N.A. a corrupt body acquires $247 million of public funds. 12. Panama Cambio Democrat founded by former president Ricardo Martinelli. 13. Panama Ricardo Martinelli / CD deputies largely responsible for public theft. 14. Jose Ayu Prado pact with Martinelli delays Panamanian justice. 15. President Varela secretary benefits from contracts. 16. President Varela proposal for a new constitution is virtually non subject. 17. President Varela promise to rid government corruption has failed. 18. President Varela former opposition leader Martinelli will run for re-election. 19. Panama 10 candidates facing criminal probes running for election. 20. Panama National Assembly buys re-election votes with their food program. Base on these and other facts: Panama is exercising broader powers toward an imminent dictatorship.